I’m sure just about everyone out there has made rice crispy treats, or at least eaten them at some point in their lives, but these aren’t your average ordinary rice crispy treats! These are super delicious, all natural, vegan rice crispy treats with coconut and dark chocolate!! I am not a vegan. In fact I am pretty far from it. If it wasn’t weird to have a bacon and cheese shrine in your house, I might have one. That said, I get a little grossed out at the ingredients in your average marshmallow…gelatin kinda makes me cringe a little. Not to mention the artificial colors and flavors. 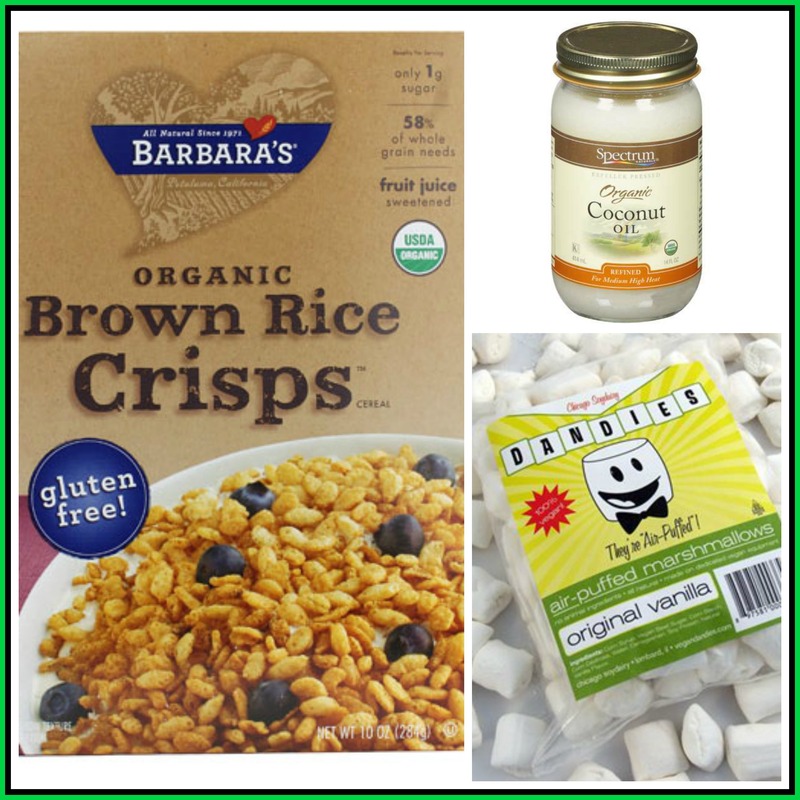 So when I saw “natural” vegan marshmallows at my local health food market, I immediately thought about making rice crispy treats! Since I was at a health food market, organic brown rice cereal was easy to find. 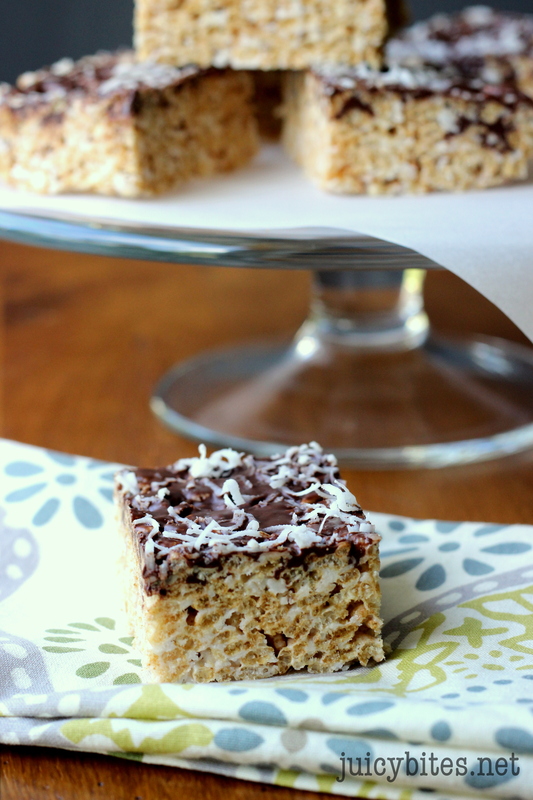 A little coconut oil instead of butter and you have vegan rice crispy treats! 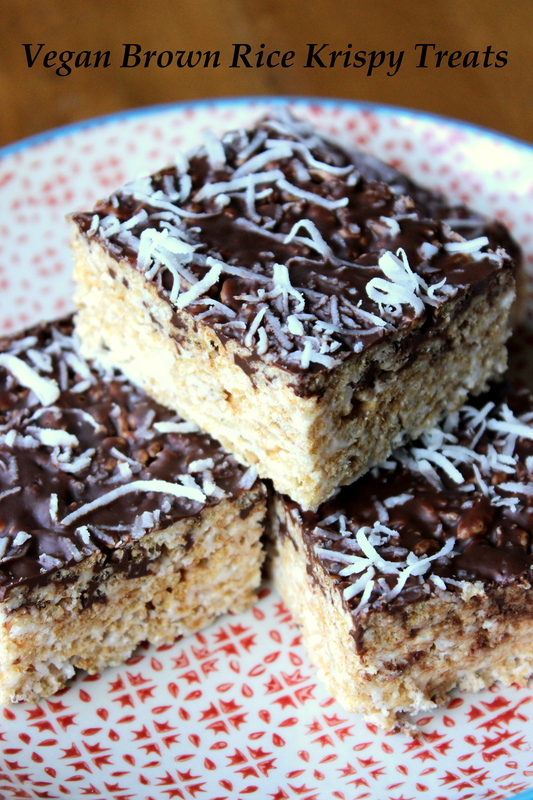 I amped up the yumminess in these by adding some shredded sweetened coconut and topping them off with some melted chocolate. Just make sure that if you want these to be vegan, look for vegan chocolate. If you are not a fan of coconut (which would be weird… just sayin’) you could leave it out and add a couple generous tablespoons of peanut butter. Chocolate LOVES peanut butter! But chocolate may just love coconut more :). I have to say, I have REALLY been looking forward to that time in the evening when I’m watching my fave DVR’d show with the Hubs and I get to indulge in one of these babies with a slightly larger than normal glass of wine. You could go with milk, but they do compliment a nice Zinfandel perfectly! I completely justify this indulgent treat with the fact that it is all natural, REAL food. That makes dessert perfectly acceptable, right? In a heavy bottomed pot, heat the marshmallows and coconut oil over medium-low heat until completely melted and mixed well. Turn off the heat and add the rice cereal (one cup at a time) and 1 cup of the coconut and gently mix well. Spoon the mixture into a 8×8 pan or a 2 qt Pyrex baking dish that has been lightly greased with coconut oil. Gently press the mixture down flat with the back of a spatula. Cover with plastic wrap and refrigerate for 30 minutes. In a small heavy bottomed pot over medium low heat, melt the chocolate and 1 tablespoon coconut oil together until smooth. Make sure to stir frequently to avoid burning. Spread the chocolate evenly over the top of the rice crispy mix and sprinkle the 1/4 cup of coconut evenly over the top. Return to the refrigerator. Once the chocolate has set (about 20 minutes), cut into squares. **Tip – It’s easier to cut these if you remove the the entire thing from the pyrex baking dish and cut with a sharp knife on a cutting board. Store them in an air tight container at for 2-3 days. They stay best stored in the fridge, but let them get to room temp before eating so they are not so hard.